I’ll be headed down to my local library to check this book out! Something in the narrative that needs to be addressed, I believe, is the effect of immigration on our country as a whole and on individuals. The Republican narrative states that “floods of illegal immigrants swarming across our border” is a bad thing, a terrible terrible thing. That’s a given, unquestioned in the conservative mind, so they don’t even need to talk about why it’s bad or how bad it is or who is harmed by it in what ways. It’s kind of a wink-wink thing, we all “know” why it’s bad. And when forced to talk about why it’s bad, they refer to things like taking American jobs, straining our resources, being rewarded for breaking the law, and getting free goodies from the American government. These things are mostly false, so I think the other side’s narrative should address that and talk about the REAL effects. It irritates me that conservatives are very concerned about there being a shortage of American jobs and other resources, which we can’t afford to waste on immigrants, but not concerned at all about having enough jobs and resources for all the extra babies born if we ban abortion. Those who want to argue against immigration from Mexico need, IMO, only point at Mexico. Do you want that? Well, no, we (liberals and conservatives both) don’t. We don’t want the U.S. to become Mexico. The illegal immigrants don’t want the U.S. to become Mexico. Nobody wants that. It’s a basic immigrant problem: you don’t move somewhere because you want it to be like the place you left (if you wanted “home” you wouldn’t emigrate, you’d just stay put! ), you move somewhere because you want the economic opportunities, freedoms, culture, climate, or landscape of your destination. And yet… you’ll vote for your destination to become like your home, you’ll want to be in a familiar community, you’ll maintain your house and your land as you would in your home region. This is why, for instance, Phoenix is very much like a Midwestern suburb writ large, and also very much like Mexican corruption married to prosperity. We end up with the worst of both worlds, because none of the immigrant communities really wants to embrace the new place, they all want to bring their favorite bits of home with them, without realizing that those favorite bits of home are why they left. Carl Rogers, of client-centered therapy note, talked about congruence. Mental health is about living a life of congruence, wherein a healthy person is “whole.” On the other hand, Scott Peck wrote a book “People of the Lie,” his exploration of evil. These “People” deal with profound incongruity through delusion and/or lies. Perhaps America, and its Founding Fathers, is a story of wrestling with major incongruities — with slavery perhaps one of the earliest and biggest. It is to the credit of those who were able to acknowledge (e.g., Patrick Henry) the hypocrisy of coexistence of freedom and slavery even though they continued to own human beings. Perhaps the Democratic ‘story’ is one of openly acknowledging and wrestling with these incongruities on a path to congruence or wholeness. As suggested by this posting on immigration, another path via story is one of denial of the incongruity itself. I’m struck by how easily this can be recast in Christian terms: We were born into a society already committed to evil, and we are redeeming it, bit by bit. “bit by bit” or revolutionary? I remember Elliot Spitzer used the phrase, “ossification of big business,” as a way of describing the function of the Republican’s policies/story. This is really about a motivation of exclusion — of preserving or reserving wealth for the few. Perhaps the Democratic story is one motivated by inclusion, of different groups being able to join in terms of the vote, economic gains, etc. Perhaps this ends with ALL Americans afforded equal opportunity. This does not translate into a nation of ‘moochers’ but rather all Americans starting at the same starting line with the right equipment — like running an Olympic track race. A story of inclusion translates into fairness — the best and most deserving performers win — and also the greatest return in terms of wealth to the community as a whole. However, it is a fact that unionized Meat Cutters in the Midwest in the 1990s made at least 1/3 again as much in hourly wages as “undocumented” workers make today for the same work. But, as pointed out, the undocumented cannot complain. I worked for a temp agency 10 yrs. ago where one job was to “verify” the “incorrect” social security numbers submitted during the year to a fast food outlet in North Carolina. The workers, once a year, were notified that the numbers on the cards they had given on their applications were not “accurate”. Once a year the gov’t sent out this listing to the Fast Food Company. Generally the workers left (or had left) before the question was asked. But the point is, they were only checked once a year. ANY social security card was “accepted” at face value even though it would be easy to check them swiftly if the gov’t would require that, which they don’t because the employers block any change of this sort. Fake social security cards represent a thriving business. The wages paid go down with the “undocumented”, but the profits go UP for the employers. 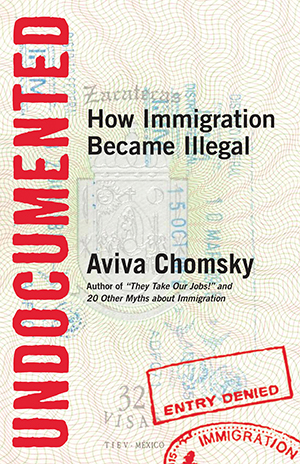 US citizens Would Certainly qualify for the jobs, but often the jobs are “sourced” to undocumented workers because they are cheaper and have no “background checks” that turn up unsavory information. Of course the undocumented want to work here, but it is false to maintain that “no Americans” would take the jobs. Canada has a robust job market …. for Canadians … they are very careful about undocumented folks applying. The problem is that it is so easy for the right wings to spread paranoid about immigrants. Just got two emails from my brother in SC about how illegal immigrants are costing us billions of dollars or sneaking in – now even through Canada. And we on the left- are simply silent to these crazy ideas that spread like wild fire. Do you have any suggestions for more “Really?” reading. I have a lot of things that I take for granted without realizing it until it’s pointed out to me. I love to expose myself to more scholarly writing which challenges those assumptions. One is a book I reviewed back in March, Slavery By Another Name by Douglas Blackmon. We all know that the Civil War ended slavery, or at least the 13th Amendment did. Blackmon shows how thousands of blacks continued to be enslaved until World War II. I’ve tried to get the “really?” effect into some of my own writing. Here on this blog, look at “Not a Tea Party, a Confederate Party”, which includes the claim that the South won the Civil War, and (on my religious blog) “Who Owns the World?”, which challenges the assumptions behind the institution of property. I agree. I reviewed Taylor’s book (along with James Carse’s The Religious Case Against Belief, another “really?” candidate) for UU World. Hey, I’m UU also! I had no idea. I just came to this blog because your post was referenced on Washington Monthly. By the way – really great stuff here. Thank you! Anyone who embraces the, “They do necessary jobs that Americans won’t do,” viewpoint (most liberals) is absolutely committed to a two-tier labor market (which is, well, antithetical to liberalism). That’s the only framework under which immigrants will do jobs that Americans won’t. 2) eliminate the job pool for illegal immigrants, which any conservative must agree is good (that job pool is dependent on the two-tier system; it relies on the ability to treat immigrant workers worse than American citizens). Everybody wins! We treat people equally and eliminate the incentives for illegal immigration! However, proponents of the status quo are in the third category: People who want a two-tier system that relies on illegal workers. This third category is not aligned with either American liberalism (because it relies on a two-tier system) nor with American conservation (because it relies on illegal workers). It is, basically, a libertarian position (we don’t care who does the job, what their future prospects might be, how they got here, or what the law says: we just want to get the job done cheaply). That’s the enemy. Unfortunately, many liberals and conservatives appear to be closet libertarians on this issue. They both ignore the inherent ideological problems with the status quo. You have Democrats arguing for a two-tier system and Republicans arguing for economic growth based on illegal immigrants. Both can sell their cases reasonably well to their bases by highlighting the details that appeal to liberal or conservative viewpoints and ignoring those in conflict, but both fundamentally betray the interests they claim to represent.